First lady Melania Trump walks through the Upbring New Hope Children's Center in McAllen, Texas, Thursday after a roundtable discussion with doctors and social workers there. The facility is operated by Lutheran Social Services of the South. Mrs. Trump arrives at McAllen Miller International Airport in Texas Thursday. Mrs. Trump climbs back into her motorcade Thursday after traveling to Texas to visit a facility that houses and cares for children detained at the U.S.-Mexico border after entering the U.S. illegally. "She wanted to see everything for herself," said Stephanie Grisham, the first lady's communications director. "She supports family reunification. She thinks that it's important that children stay with their families." She, along with first daughter Ivanka Trump, lobbied the president to reverse his administration's family separation policy, NPR reported on Wednesday. The first lady planned to visit two facilities, both in McAllen, Texas. Her first visit, according to the White House pool reporters traveling with the first lady, was to Upbring New Hope Children's Shelter and lasted about 75 minutes. The shelter is a Health and Human Services Department grantee facility run by Lutheran Social Services of the South, and it's part of a network of 32 state-licensed facilities in Texas, according to the Center for Investigative Reporting. CIR says the center had 12 health and safety violations over the past three years. The kids the first lady visited there were ages 12-17, and most crossed into the U.S. as unaccompanied minors, but six of the children were separated from their families upon being detained. When Mrs. Trump visited, the kids were in the middle of classes. She shook hands with children and asked them where they were from and how long they'd been there. "Be kind and nice to other, OK? Nice to meet you," she said as she left one classroom. At a roundtable discussion, the first lady asked the shelter's program director, Rogelio De La Cerda Jr., what physical and mental state the kids arrive in. "Usually, when they get here, they're very distraught in the sense that they don't know where they're at," he said. "When they see the environment and they see the other kids and they see the yard, they start relaxing." Mrs. Trump then responded: "It's a process, yes, but I'm sure they're very happy. They love to study. They love to go to school." Kids applauded her when she left one of the classrooms she visited, and she left behind a signed American flag when she departed the shelter. Her second scheduled stop, at the Ursula Border Patrol Processing Center, a Customs and Border Protection intake center, was canceled because of flooding in McAllen. A Department of Homeland Security official told NBC News that the Ursula facility was the "epicenter" of the Trump administration's policy that separated more than 2,000 kids from their parents over the past few months. Intake centers, like Ursula, are where many viral images of people in chain-link enclosures originated from. The trip came after the family separation controversy grew nationally in the past week. Administration officials and conservative media outlets have argued that the living conditions of detained immigrants aren't as bad as traditional media outlets have been portraying. "No one wants to separate families but Americans should rest assured that minors who are referred to [federal government] funded facilities are well cared for," tweeted HHS Secretary Alex Azar Wednesday evening. Fox News host Laura Ingraham said the detention facilities "are essentially summer camps" on her show on Monday, whereas former first lady Laura Bush said they were "eerily reminiscent" of World War II Japanese internment camps in a Washington Post column on Sunday. Mrs. Trump was going to visit the facilities herself, her spokeswoman said, because "she wants to see what's real. She wants to see a realistic view." As she toured the facility in Texas, one of the first lady's clothing choices drew criticism for being insensitive. 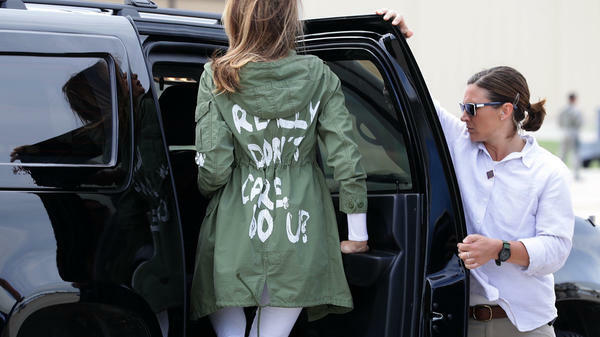 As she was boarding the plane in Washington to leave on the trip, Mrs. Trump was photographed wearing a jacket that read "I really don't care, do u?" in block letters on the back. Grisham, the first lady's spokeswoman, said not to read anything into the clothing choice. "It's a jacket. There was no hidden message," Grisham said. "After today's important visit to Texas, I hope the media isn't going to choose to focus on her wardrobe." In a post on Twitter, Grisham criticized the focus on the first lady's wardrobe and said "Today's visit w the children in Texas impacted @flotus greatly." On her return to the Washington, D.C., area, the first lady was photographed again wearing the jacket with the controversial message. And Thursday evening the president himself tweeted about the jacket's message, saying it "refers to the Fake News Media." President Trump added that his wife "has learned how dishonest they are, and she truly no longer cares!"